Every Christmas since I was a child, I would make a beeline towards a couple or sometimes a lone person, looking hopeful yet resigned in a corner in front of a red tin cauldron. Drawn by the sound of the bell and a legacy, I would stride over ... and drop a dollar or more into the cauldron. This has been a legacy I followed no matter how broke or depressed I was and wherever I am in the world. It is because I remember what my mother told me as a child. About how after the war, she was fostered out for a while. To an Australian couple who worked for the Salvation Army. The period right after the war was a very bad time for everyone. My grandmother was unable to deal with the ravages of the war and all the children were being neglected despite my desperate and helpless grandfather's efforts to be a single parent of sorts. By the time my mother's foster parents came to rescue her, she was as thin as a rake and terribly sickly. She told me how she might not have survived if not for this kindly couple. The fact that she never saw them again after she was returned to her parents was one of the her greatest regrets. She never got to thank them. The fact that they never asked for thanks or acknowledgement made them even more unforgettable. The fact that I would not be here if not for the kindness of two strangers who came in from the dark one night to offer aid, love and kindness is something I cannot ignore. 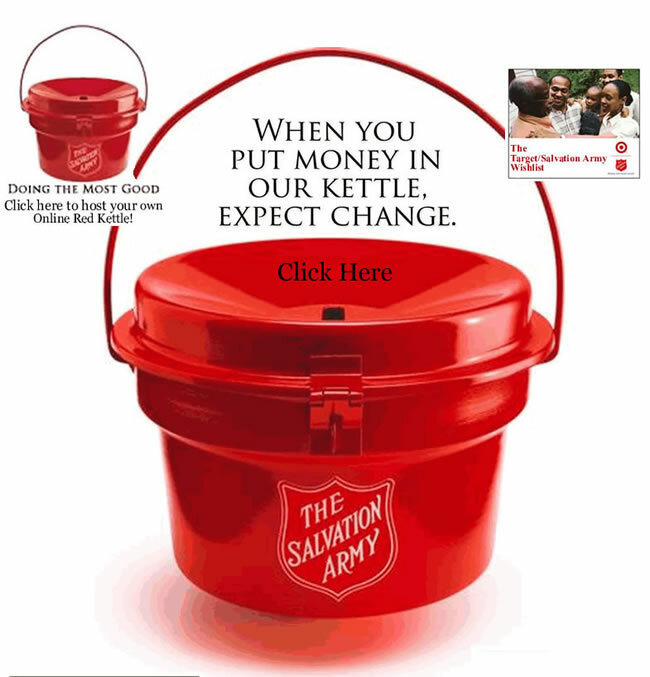 My mother would give me a penny (growing to a dollar as I grew older) to place in the Salvation Army red tin every time we passed one when I was a child. She would recount the story and tell me I was growing closer to baby Jesus every time I dropped a coin. It became our little ritual every Christmas. So every year, during Christmas even after my mother is gone, when I see the Salvation Army post, I would follow my heart and return the favour. I would go as many times as possible each season. I still get embarrassed when they would thank me and want me to give me something in return or offer to send me an acknowledgement. I would refuse. Because it is I who should repay them. Inspired and eternally thankful to those two kindly Australians, I want to do the same - to give without expecting reward and to remain anonymous so that someone can have hope and faith in the unconditional kindness of strangers. It is a rare thing nowadays to receive such unconditional kindness. Not for these the spotlight of Oprah or the fodder for boasts at company functions. True kindness as shown by the Salvation Army is something that is rare. That we saw much of these in the days after last year's tsunami, Hurricane Katrina and the tragedy in Pakistan is a bittersweet privilege. In the last month, I was saddened to see the racial unrest in Australia. Especially saddened to think this is the legacy those two kindly Australians have left behind. To be honest, I have experienced my share of racism in Australia in recent years and so I was not surprised. I was just surprised at the timing and the extent of it. So close to the Bali bombing, the tsunami, 911 even ... have we learnt nothing? Tell you what, people. Let's take a little walk together. You hear that bell? Let's follow it. Open your heart. Then open your wallet. If you cannot afford more, even a penny will do. Then place your hand over the slot in the cauldron. And let go all your hatred, misery and fear in that little penny. Give it over. Let someone else take that and transform it into hope for another person in greater fear and misery. Have a wonderful Christmas all. May it be peaceful and loving. Very nice post. I have also enjoyed donating to those red kettles every Christmas. Hi, thanks for visiting my blog. Any herb, plant, veggie, or flower is ok for Weekend Herb Blogging. It started as a joke, but now we have fun learning about new plants from all over the world. The next two weeks I am not publishing the recap until Monday because of the holidays. Just link to me with the words Weekend Herb Blogging and then send me the link (kalynskitchen *at* comcast *dot* net). Then I will include you in the recap on Monday. I will defintiely try to contribute! Have a brilliant Xmas hols!